Product Details-Optimal air circulation due to air holes, High quality design,Recommended for pets up to 13lbs (6kg),Perfect for rabbits, cats, and small dog, Colour- Dark Blue. 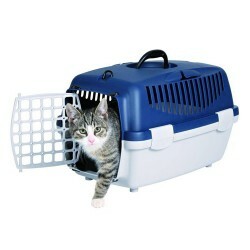 Product Description-This pet carrier is ideal for the transport of cats, small dogs and other small animals. It has a holding device for the car seat belt which makes the transport more secure. An extra lid allows to pet your animal without opening the door.Capri 3 features a storage tray and a stroking flap on top. The stroking flap allows to pet your animal without opening the main door.